StayPut Heavy Duty Professional is a durable non slip fabric that can be used in all areas that need a deep density protective cushion and be able to withstand tough treatment. 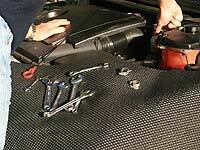 StayPut Heavy Duty Professional is made of a thick 4mm non-slip foam melded into a strong PVC mesh, supported by polyester fibres. The unique manufacturing process produces a robust sponge like fabric which doesn’t stretch, stick or rip, but will grip effectively on both sides. 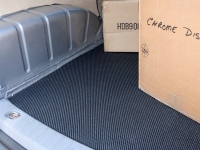 lining the boot of a car/van preventing movement and damage to floors. 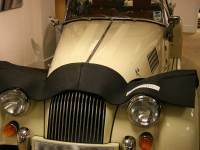 As a vehicle drape, protecting paintwork and preventing damage from tools. So why use StayPut Heavy Duty Professional? Non-Slip - Simply, it helps prevent items from moving or sliding, on the workbench reducing the need for clamps, in the toolbox to stop tools sliding around, or on the floor of a car or van. The open weave structure is also free draining, making the fabric an effective non-slip surface even when wet. 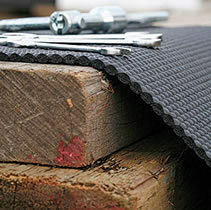 Can be sewn – Ideal for applications where the fabric is to be integrated with other materials. Bulk Rolls – Provide greater flexibility for volume / commercial users. Isagi Professional is highly versatile and can be used virtually anywhere you need to protect surfaces or stop slippage. The only limitation is your imagination, see the ‘ideas for use page’ as your starting point, and please feel free to email us with your own suggestions.